What is Radiesse (+) 1.5ml with Lidocaine? Banish wrinkles and folds with Radiesse (+) 1.5ml with Lidocaine. This dermal injection acts on aging skin to restore volume to dermal tissues and correct skin depressions and sunken facial areas in the process. These results are prolonged as Radiesse (+) 1.5ml with Lidocaine stimulates new collagen growth at the site of implantation, which replaces the Radiesse filler for volumizing effects. 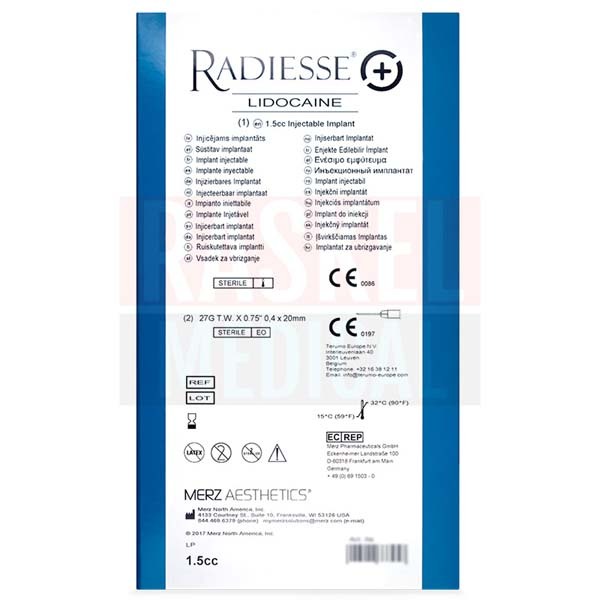 Radiesse (+) 1.5ml with Lidocaine is supplemented with lidocaine, an anesthetic, for the reduction of injection-associated pain. What is Radiesse (+) 1.5ml with Lidocaine is formulated to do? The main component of Radiesse (+) 1.5ml with Lidocaine is calcium hydroxylapatite, a mineral that is naturally present in human bones and teeth. In Radiesse (+) 1.5ml with Lidocaine, this mineral is formed into microspheres that are then suspended in a gel carrier containing carboxymethyl cellulose. When implanted into the skin, the microspheres remain at the site of injection where they act as a scaffold for new collagen formation. Gradually, the gel is replaced by new collagen, which maintains the volume enhancement even as the carboxymethyl cellulose is resorbed and the calcium hydroxylapatite particles are phagocytized into ions. For this reason, Radiesse results have a great deal of longevity, lasting up to a year or more as shown in clinical studies. This version of Radiesse contains the anesthetic agent lidocaine to enhance patient comfort during the procedure. 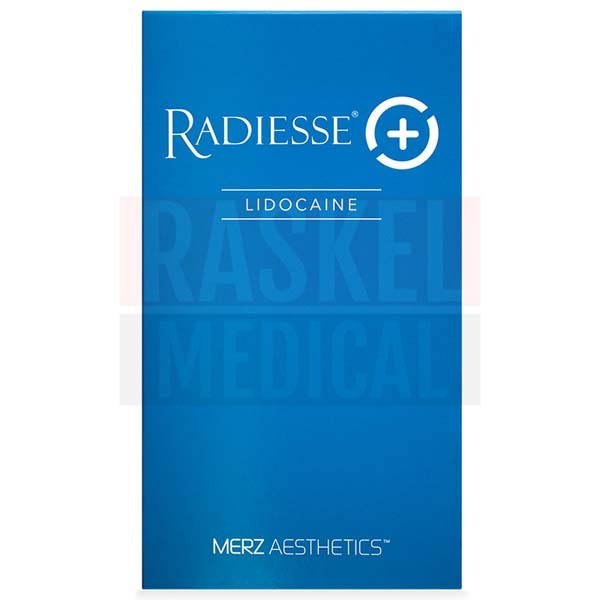 Radiesse (+) 1.5ml with Lidocaine is manufactured by Merz Pharmaceuticals, a global pharmaceutical company that specializes in providing medical aesthetic treatments. This skin filler is of European origin. When can Radiesse (+) 1.5ml with Lidocaine cause side effects? As with all injectables for face, treatment with Radiesse may result in adverse events. For one, patients may experience injection-related reactions, such as bruising, redness, swelling, pain, and itching localized to the injection site. If the patient is receiving a Radiesse treatment in their hands, they may experience nodule or bump/lump formation that may last up to a year, transient difficulty in performing activities, or loss of sensation in addition to the previously mentioned reactions. This may not be a complete list of side effects. Refer to the package insert for a full list of side effects, warnings, and contraindications. If any adverse effects are prolonged or worsen, your patient should contact you or another medical professional. Which skin type is Radiesse (+) 1.5ml with Lidocaine good for? Radiesse (+) 1.5ml with Lidocaine is suitable for mature skin that displays visible signs of aging, such as moderate to severe wrinkles and facial volume loss. What is this product made without? The calcium hydroxylapatite microspheres contained in this skin filler are synthetic and non-animal derived; as such, the risk of allergic reactions is low. This dermal injection is provided in a syringe packaged in a foil pouch and is boxed for convenient storage. Has the FDA approved Radiesse (+) 1.5ml with Lidocaine? Radiesse obtained FDA approval in 2006 and is the only dermal filler approved for volume restoration in hands. Radiesse also received the CE mark for aesthetic use in Europe in 2004. What are the differences between the products in the Radiesse line? Radiesse consists of 2 size options, both of which are available in formulas with and without lidocaine. The smaller 0.8ml version is meant for the treatment of moderate wrinkles and folds, while the 1.5ml version contains more material for the treatment of more severe wrinkles and folds. Prior to treatment, fully inform your patient of the expected outcome(s), indications and contraindications, precautions, warnings, and potential side effects of Radiesse (+) 1.5ml with Lidocaine treatment. Mark and prepare the injection site with a suitable disinfectant. Assemble the syringe and injection needle by attaching the needle to the Luer lock port on the syringe. Slowly inject the product into the subdermal plane, placing the product in linear threads while withdrawing the needle. Continue administering this product until the desired result is achieved. Lightly massage the treated area to distribute the material evenly. 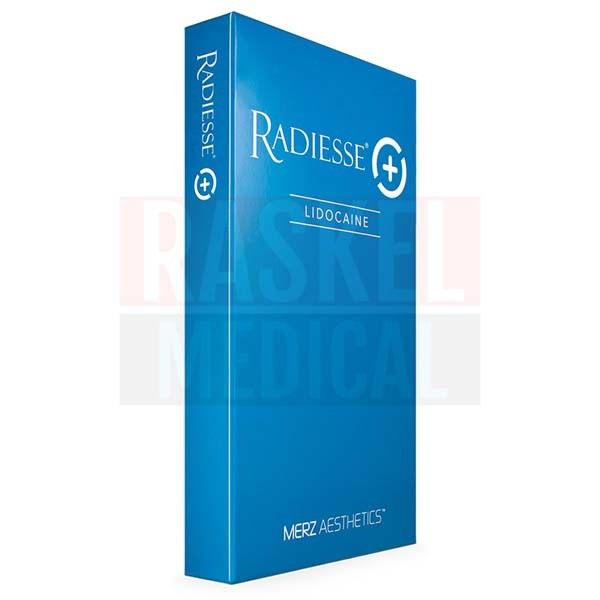 Radiesse (+) 1.5ml with Lidocaine is a sterile, semi-solid, cohesive, and non-pyrogenic gel that is comprised of synthetic calcium hydroxylapatite microspheres in a gel carrier. The gel carrier consists of glycerin, sodium carboxymethylcellulose, 0.3% lidocaine hydrochloride, and sterile water for injection. Due to its additional effects of neocollagenesis, Radiesse (+) 1.5ml with Lidocaine provides a lengthy duration of correction, with many patients reporting results that last a year or more. 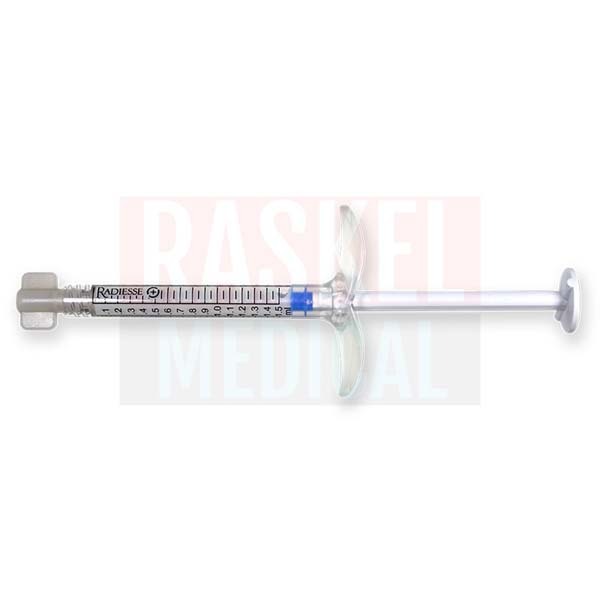 Store this dermal filler in an environment that has a temperature range of 15–32°C. The expiration date of a package of Radiesse (+) 1.5ml with Lidocaine is 3 years from date of manufacture. Do not use a package of Radiesse (+) 1.5ml with Lidocaine if the expiration date has passed.